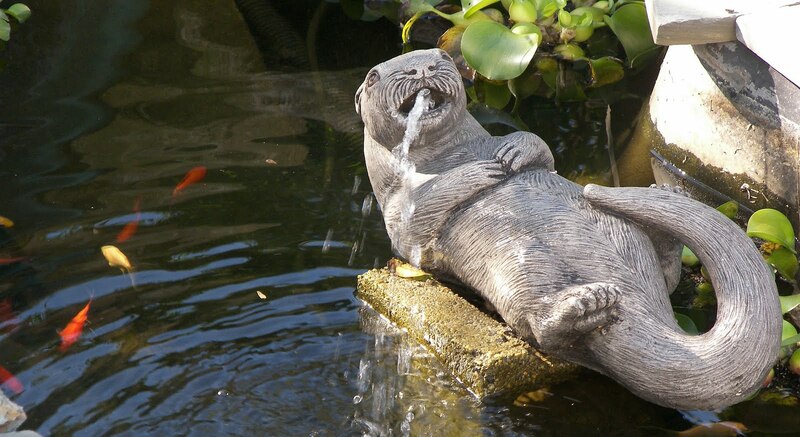 Devoted followers of this blog (both of you) will remember that last summer our stone otter, Alfie, met with a nasty accident that left his bewhiskered head at the bottom of our fish pond. Despite heroic efforts by Seely to perform reattachment surgery, we were unable to restore the victim to full function (which include serving as a recirculating pump for the pond and a convenient place for birds to settle). After allowing for a suitable period of grieving, Seely's sister Beth began an extensive internet search for a replacement. I was skeptical that it would be possible to find a another pump as lifelike and efficient as Alfie at an affordable price. I should know better than to underestimate my sister-in-law. 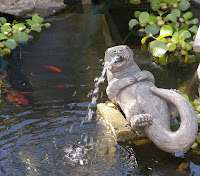 On my birthday, Fed Ex delivered a sleek, beautiful stone otter pond pump. Based on no evidence whatsoever I decided that this one was female and named her Selena. I have no idea how much of her valuable time Beth wasted to give me a birthday smile, but I appreciate it. So now everybody's happy. The birds have a belly to perch on when take a drink from the pond, the fish are happy to have a working pump, and I feel much better when I look out my window because our wildlife area now seems complete.